We’ve almost got the details down to door knobs and window treatments,” reported Mike Burke at a recent community briefing on the Marblehead Coastal project. Project Manager Burke, who has been working on this land development endeavor since 1977, admitted he has almost impossible shoes to fill with the untimely January passing of visionary builder Jim Johnson. He promised that all of Johnson’s desires would be fulfilled: a hotel, a convention center, customer-oriented commercial businesses, first class restaurants, attractive residences, and Courtney’s Sand Castle, a tot lot to serve both able and disabled children. Johnson, a longtime official of the Lusk Corporation who had previously developed Westlake Village in Ventura County, spearheaded San Clemente’s Marblehead Inland housing development and was the guiding light for its sister coastal expansion. A proactive local resident, he religiously contributed to an array of programs benefiting the community, especially on behalf of children and seniors. The Boys and Girls Club, the Sunrise Senior Center, the Ocean Festival, and the Friends of Beaches, Parks, and Recreation Foundation are only a few of his many recipients. Attorney Mark Maguire, like Burke, a San Clemente resident, serves as Project Representative. He reviewed the recent activities of the project planning team, which included the approval of a park plan with three unlit soccer fields at Shorecliff Middle School and three smaller neighborhood parks. Maguire reviewed the land use of the 247 acres; one hundred are dedicated to natural habitat to remain in a pristine state. Canyons and breathtaking ocean views will be enhanced by 20 acres of parks, greenbelts, and trails. 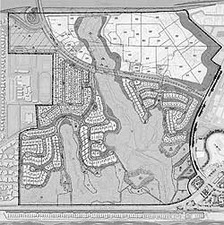 Three hundred and thirteen homes will be built on 60 acres extending from the west overlooking the ocean and El Camino Real, flowing northward adjacent to the current Shore cliffs area, south to Avenida Pico, and extending eastward up the slopping hill to meet the commercial portion of the project. The new homes will be constructed in four distinctly different neighborhoods, one of which would include courtyard houses ranging from 1600 square feet to 2300, some connecting garages with common walls. Maguire emphasized that there are no single story homes, community pools or condominiums on the property. In the lower southeast, an open pad will be donated to the City. Maguire foresees a master homeowner organization, possibly with additional neighborhood associations providing governance to the residential sections of the project. Five years will be needed to add appropriate vegetation to the natural habitat for appearance and to improve water retention capacities. The management of the open spaces may be deeded over to another entity and will be protected by an easement. Maguire and his colleagues are distinctively proud of the planned state-of-the-art water runoff system. An innovative scheme that future land developers are certain to adopt, the system treats rainwater and landscape and waste drainage. It captures low flow run-off and storm action through a series of water quality basins and large holding tanks. Steve Craig, principal of the Craig Realty Group, and Joe Sietz of SDC Development are developing the 50 acres set aside for commercial purposes – Plaza San Clemente. Craig headed the successful nearby Carlsbad Company Store, and has designed, developed, and operated shopping centers in 11 states, as well as Milan, Italy. Sietz has worked with over 100 shopping center projects throughout California. For San Clemente’s newest plaza, adjacent to Highway 5, they envision a business complex including a hotel; convention center; 15-screen movie theatre; one hundred shops like The Gap, Banana Republic, and Polo, each approximately 3,000 square feet in size; and 10 restaurants, strategically located to provide both ample parking and canyon and ocean views. The restaurants will range from low prices to high, family sit-down to romantic settings, and cuisine of all varieties. While reviewing renderings describing the Business Park including the walkways and overall layout, Craig proudly announced, “There’s not a stair in the entire project. The visual concept suggests that the buildings have been around over a long period of time with its variety of mixed architecture, peaked gables, and very little repetition of design: Colonial, Monterey, Seville and Spanish.” The parking structures will hold up to 3,000 vehicles. Rather than attracting a large hotel chain, Crain and Seitz prefer an operator who will take advantage of San Clemente’s climate and beaches, existing community amenities and facility needs, as well as tourism. They envision a hotel, with 130 suites sized between 450-470 square feet, as “…. a cross between a bed & breakfast and a European hotel, with a nightly rate of around $129 per night. In this area, we should have an alternative to the Montage, the Ritz Carlton, and St. Regis,” claimed Craig. Most of the hotel rooms will have ocean vistas. On the inland side of the four-story structure, a convention center for up to 500 patrons will be attached. With a desirable lodging facility, which can host 60- 80 weddings a year, and a meeting area with a large gathering room and “break-out” rooms, the hotel/convention complex should fill a current void in San Clemente’s offerings.